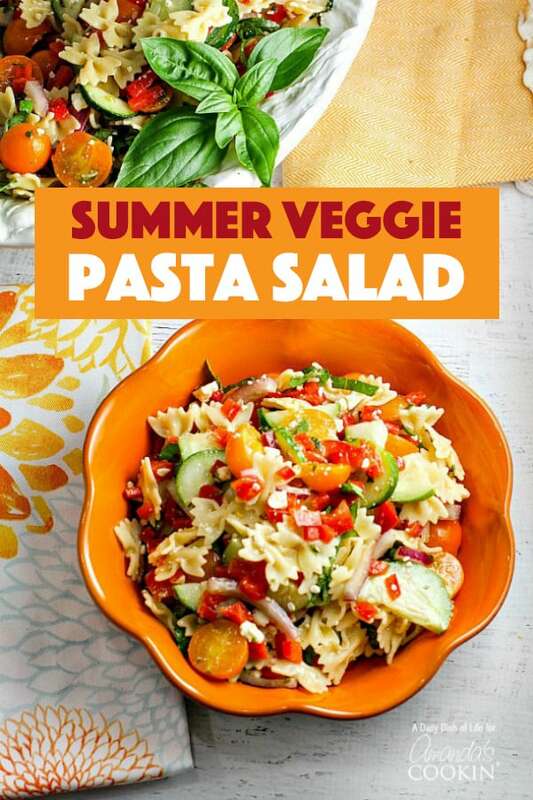 This simple and delicious summer vegetable pasta salad is full of flavor, packed with vibrant veggies and just the right amount of crunch. This colorful pasta salad makes use of all those gorgeous summer vegetables you picked up from the farmer’s market and is guaranteed to be a hit at your summer BBQs- just like this Chicken Salad with Grapes recipe! 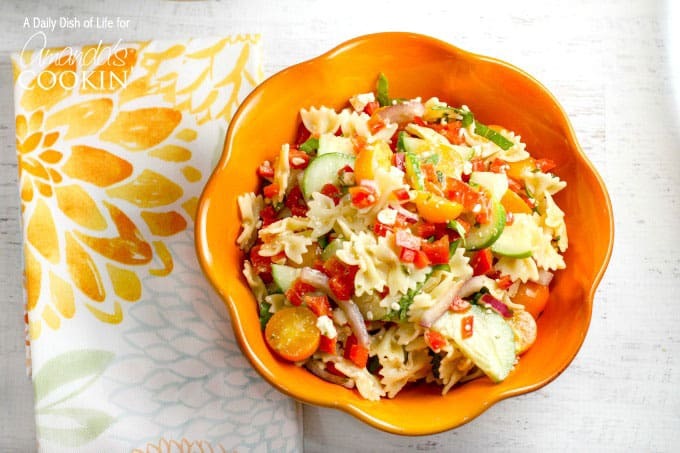 Pasta salad is a staple at summer cookouts and they are great for potlucks as well. I love a good pasta salad as much as the next person, but with the summer heat, I prefer to stay away from a mayonnaise base. I’m actually somewhat of a vinegar fanatic so I’m using a vinegar based dressing for this summer vegetable pasta salad. Our farmer’s market is in full swing right now, and I am loving it. Have you ever had a Sun Gold tomato? Those are my absolute favorite. There is nothing better than a Sun Gold tomato right off the vine! And farm fresh cucumbers have a crunch that you just don’t get from the ones at the grocery store. I always make my own salad dressings. They’re so easy to make, and you know exactly what is going into the dressing when you make it yourself. This dressing has a little bit of sugar in it. Usually my “sweet” is honey, but sometimes I like to mix it up. I’ve made this summer vegetable pasta salad twice in the last couple of weeks, and both times it disappeared really quickly. People were going back for seconds and thirds! 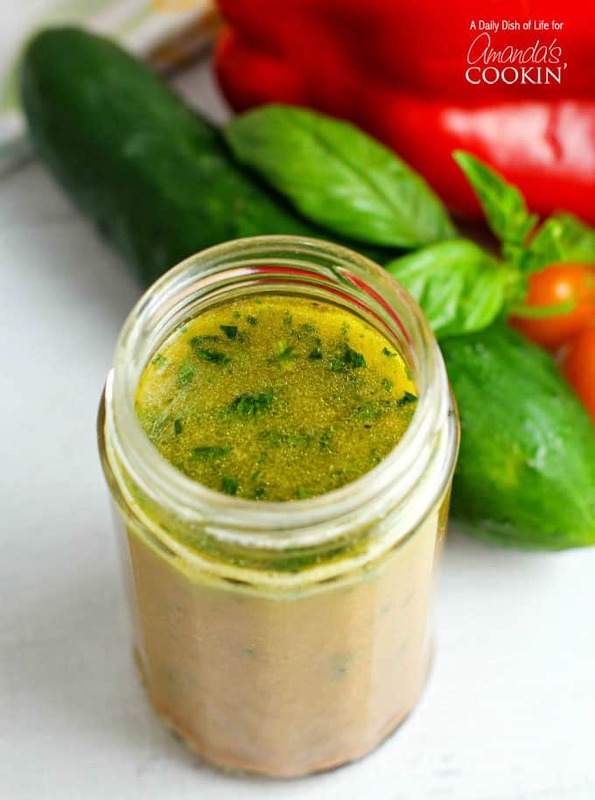 I’d recommend making it a day ahead…it’ll taste even better the second day when the dressing has really had a chance to soak into the pasta and vegetables! 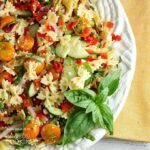 If you think this summer vegetable pasta salad looks good, wait until you see these other recipes I’ve chosen just for you! This Fiesta Guacamole has party written all over it! Packed with bright and colorful summer veggies, it takes your favorite avocado dip to a whole new level! 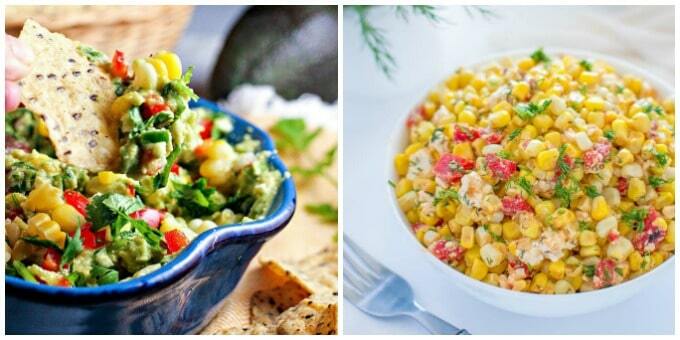 This versatile Corn and Feta Salad will be a hit at your next picnic or BBQs. Sweet corn, makes roasted peppers and salty feta is perfect as an appetizer, or even as a salsa with grilled chicken or fish. Talk about great colors! This Mediterranean Pasta Salad is full of color and flavor! If you love chicken fajitas, this Chicken Fajita Salad is the perfect healthy alternative. Are you in a hurry? 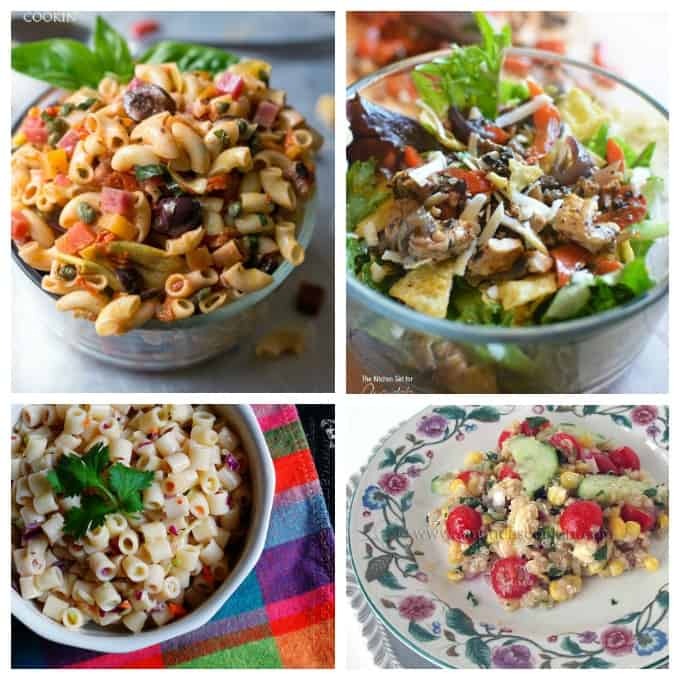 Try my 3 Ingredient Quick Pasta Salad for a super short-cut version. Another great way to use up your farmer’s market bounty is with this delicious Summer Vegetable Quinoa Salad. NOT PICTURED- Want something even the pickiest eaters will enjoy? Our Taco Pasta Salad may be your solution. Who doesn’t love tacos?! Want even more free recipes? Be sure to join my newsletter for FREE recipes and craft ideas sent to your email inbox every week. 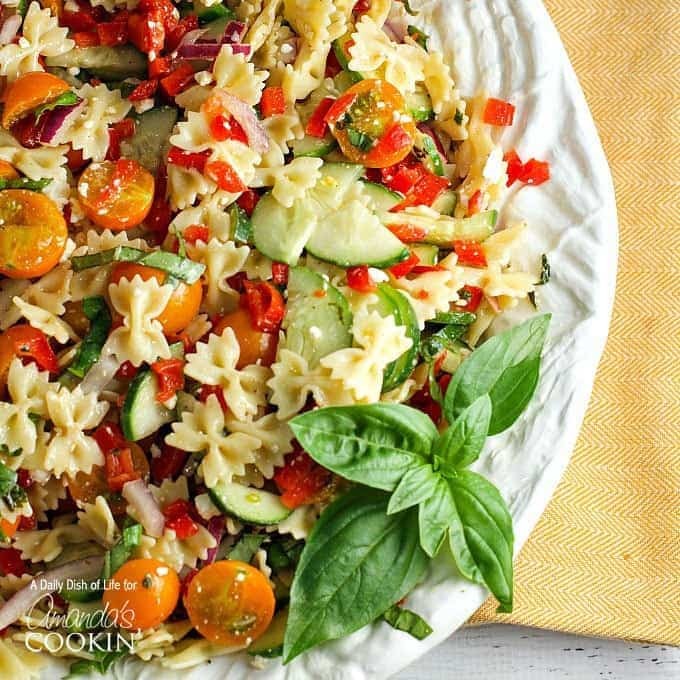 This simple and delicious Pasta Salad is full of flavor, packed with summer veggies and just the right amount of crunch. Guaranteed to be a hit at your summer BBQs! Combine all dressing ingredients in jar and shake vigorously. Adjust salt and pepper as needed. Set aside. Combine chopped onions with a couple tablespoons of the dressing. The vinegar in the dressing takes a bit of the "bite" out of the onions. Drain pasta and rinse with cold water to cool. Mix pasta with chopped vegetables, basil chiffonade, and crumbled feta. If making salad a day ahead of time, I'd recommend chopping your tomatoes on the day you plan to serve it and adding them to the salad then. *I usually have a little bit of salad dressing that I can then use to dress salad greens on another day. This post was originally published on this blog on July 15, 2016. 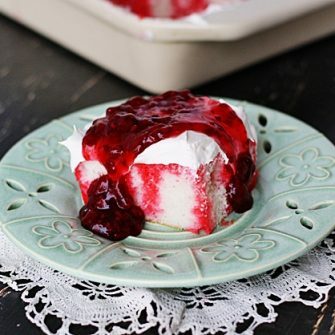 Gracias por compartir deliciosas recetas. En hora buena.